The plastic injection molding process is a cycle process. Once cycle is completed, the once injection cycle is completed. Each cycle mainly includes: quantitative feeding, melt plasticizing, pressure injection, mold filling, cooling, and mold opening and demolding. After demolding, the mold is closed and the next cycle is performed. Each time the injection molding cycle is completed, the injection device and the clamping device of the injection molding machine respectively complete one working cycle, and that is, the moving parts of the injection device and the clamping device are sequentially operated once in a predetermined order. There are three stages to complete injection molding: plasticization, injection, and shape. The plastic material falls from the hopper into the barrel and is conveyed forward by the rotating screw. In the barrel, the plastic receives the heating from the outside of the barrel on the one hand, and is compacted by the gradual decrease of the volume of the groove on the other hand, and when the screw rotates in the barrel, it will strongly agitate and shear the plastic, causing intense friction between the plastic and between the plastic and the barrel and the screw, generating a large amount of heat, so that the plastic is pushed forward while being pushed forward. Gradually plastic plasticized into a molten state. Due to the back pressure of the screw head, the screw rotates while still retreating to store the plasticized melt at the top of the barrel for injection. The screw retraction stroke is determined by the amount of shot material required for a molded product. 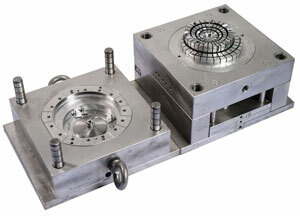 When the screw stops rotating and retreats, the mold clamping part starts to work to close the mold, and then the injection device moves forward, so that the injection nozzle and the mold sprue mouth fit together, and the injection cylinder piston pushes the screw to move forward rapidly. The molten plastic is injected into the mold cavity at the injection pressure and speed required by the molding process. In order to prevent the reflow of the molten material injected into the cavity and to replenish the small amount of melt required for injection mold part shrinkage due to the cooling of the product, the screw after the injection is still required to maintain a certain pressure on the melt, that is, the pressure is maintained until the material located at the gate is cooled and shaped. After the melt in the cavity cools, it returns to the glass state from the viscous flow state. After the product in the cavity is completely cooled and shaped, the clamping mechanism is opened, the mold is opened, and under the auxiliary action of the ejection mechanism, the product is demolded, and the whole process of injection molding is completed.